If you know where to look you can find sculptors, farmers, astronomers, welders, storytellers, clock repair experts, and cartoonists right in your community. Let’s take my hometown of Cleveland as an example. I can learn glass blowing at the Glass Bubble Project, eviscerate and stuff a rat to look like a tiny tie-wearing butler during a taxidermy workshop at Sweet Not Salty, apply Brian Swimme’s cosmology to my life direction at River’s Edge, make pasta by hand at Loretta Paganini School of Cooking, march with the Red Hackle Pipes & Drums band as I learn to play bagpipes from a former Pipe Major of Scotland’s Black Watch, drop my kids off where they can partner with working scientists at the Cleveland Museum of Natural History’s future scientist program, volunteer to rehabilitate injured birds at the Medina Raptor Center, and learn to make handmade books at the Cleveland Institute of Art. Museums, libraries, colleges and universities, cultural and ethnic organizations, recreational centers, and plenty of other places in your neighborhood are brimming with great workshops and classes too. This can happen more informally as well. As homeschoolers, we’ve found it doesn’t hurt to ask people to share a little of what they know. The owner of a steel drum company explained the history and science of drum-making, talked about the rewards and risks of entrepreneurship, then encouraged us to play the drums displayed there. A NASA engineer took us through a testing facility and showed us how materials are developed for the space program. 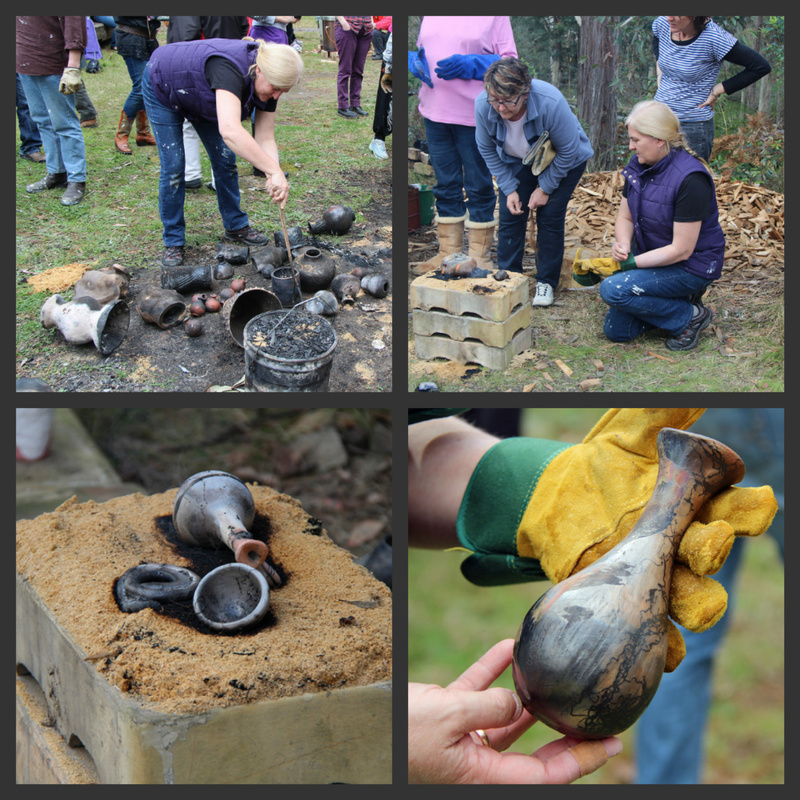 A potter talked to us about the nature of clay, taught us how to form vessels on a wheel, then invited us back for the opening of his kiln to see our creations emerge. We’ve spent days with woodworkers, architects, chemists, archaeologists, stagehands, chefs, paramedics, and many others. Despite offers of barter or pay, we’ve gotten all this expert instruction for free. People rarely turn us down when we request the chance to learn from them. Perhaps the desire to pass along wisdom and experience to the next generation is encoded in our genes. If someone possesses knowledge or abilities you’d like to gain, try asking. And don’t forget to look close to home. You might master pinochle while spending time with your brother-in-law, learn cake decorating from your sister the caterer, gain new appreciation for fly fishing from your dad’s business partner, pick up horse-racing lingo from your neighbor, and as we all know, learn more from your own kids than you’d ever imagined. The Amazings offer non-traditional workshops and classes set up by “amazings,” people over 50 with a passion to share what they know. Their site explains, “We want to make learning more fun, more friendly, more social, and more personal.” So far they have 45 people offering expertise in areas such as bookbinding, perfume making, foraging, carpentry, jazz guitar, philosophy, and corset making. The first branch is based in London, but they’re open to starting more around the world. FreeSkools are created by participants. There’s no central organizing manifesto on one site or in one book. Some are informal gatherings to share knowledge, others are active networks meeting in parks, living rooms, and community centers. All are devoted to learning freely. You’ll find them in Ithica, Santa Cruz, Asheville, and dozens of other cities in the U.S., Canada, and U.K. Check out piece in Yes! about what to consider when setting up a FreeSkool. The School of Life is teeming with great stuff. They feature secular sermons with big thinkers talking about big ideas. Classes by experts with titles like Office Politics, How to Have Better Conversations, and Finding a Job You Love. Bibliotherapy: basically book prescriptions custom-designed with your reading history, dilemmas, and desires in mind. The place is also teeming with activity beyond the sit still and think variety. There are engaging programs with transformative potential and weekend adventures developed by scientists, artists, and others. Oh, and what they call Utopian Feasts. So far there’s one in London with a branch opening in Australia.